Measurement at the sample concentration of 0.1 ppm is possible. Violet semiconductor laser (wavelength: 405 nm) is used for the semi-permanent light source. Maintenance, such as gas replacement, is unnecessary. The detector incorporates 78 elements at the front, one element at the side, and 5 elements at the back, for a total of 84 elements. Additionally, high-sensitivity light receptors that support Violet semiconductor laser wavelengths are adopted with all detectors. 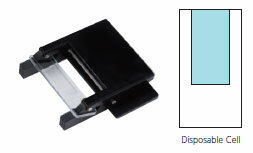 The fixed parts of the cell and cell holder can be pulled out at the front of the unit using a slide mechanism, as shown in the photo on the left. This makes it easy to mount and replace cells, and to perform maintenance. WingSALD bio standard software is supplied as standard. It offers versatile data processing and simple, high-speed operation to suit every purpose and processing requirement. 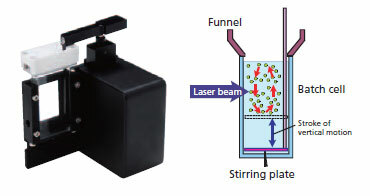 High-concentration samples can be measured using the laser diffraction method. 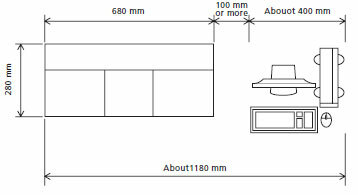 Measurement is possible by simply holding the high-concentration sample particles to be measured between two glass slides. 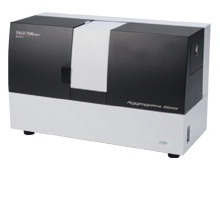 Samples for which the particle size distribution would be changed by dilution can be measured in their original state, or with the minimum required level of dilution, and true images of the measurement object can be obtained. Commercial hand creams, face creams, and rinses can be measured with hardly any pretreatment. If a standard flow cell or batch cell is used to measure a sample at a high concentration, the long light path length results in multiple scattering, making it impossible to obtain accurate measurements. Accurate measurement is possible by simply holding the high-concentration sample particles to be measured between two glass slides, which shortens the length of the light path and avoids the negative effects of multiple scattering. Also, arranging the glass slides so that they are diagonal to the optical axis makes it possible to detect side scattered light. Applying particle size distribution calculations to this and to forward scattered and back scattered light enables high-concentration sample measurement for fine and ultrafine particles. Measurement is possible with small amounts of sample (i.e., measured particles) and liquid medium (i.e., dispersion medium). The capacity of the batch cell is only 5cm3 so waste treatment for the suspension can be performed with relatively small amounts. The vertical motions of the stirring plate prevent sedimentation of the particles. The funnel reduces the possibility of sample spillage. A tetrafluoroethylene resin funnel is provided to reduce the possibility of suspension getting on the hands of the user. It also prevents the cell surface from becoming dirty.